Women’s fertility and labour supply decisions are made simultaneously, making it difficult to identify the effect of the former on the latter. This column explores the relationship using a dataset spanning 200 years and 103 countries, leveraging twin births to isolate causal effects. The key finding is that as countries develop, women’s labour supply becomes more responsive to additional children. The global decline in fertility over the last century has played a positive role in increasing women’s work in developed countries, but a negligible one in developing countries. In her classic monograph, Claudia Goldin (1995) documents that female labour force participation in the US followed a U-shape over the 20th century, initially decreasing as work shifted from farms and domestic production into factories and formalised workplaces and eventually increasing as women were pulled into the workforce during WWII and the post-war period. 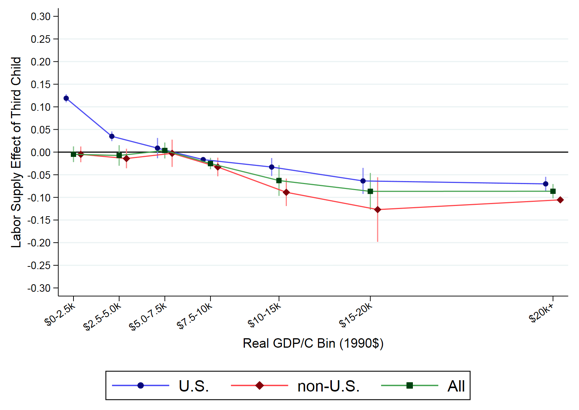 However, over the last two decades, that post-war trend stopped in some countries, perhaps most notably the US. Naturally, these latest trends have led researchers to focus on the role of children and, in particular, the increasing cost of childcare for women in the modern economy. Moreover, at the other end of the development spectrum, poorer countries have wrestled with whether fertility reduction policies can induce increased female labour force participation and positively feed into the process of economic growth. These enduring questions are at the heart of our recent working paper which seeks to understand when and why fertility impacts women’s labour supply (Aaronson et al. 2017). To answer these questions, we assembled a comprehensive dataset on women’s work and fertility, spanning more than 200 years, 103 countries, and 441 country-years. Notwithstanding the breadth of our data, there is a significant conceptual challenge in identifying the effect of fertility on women’s work. Both fertility and labour decisions are made simultaneously, and so common factors affecting both decisions can render the correlation between them uninformative about the key causal and policy effect of interest. We get around this problem by primarily focusing on twin births (following an extensive literature; see Rosenzweig and Wolpin 1980, Bronars and Grogger 1994, Black et al. 2005, Bhalotra and Clarke 2016). Comparing women who had a singleton versus twin birth, we get something of a natural experiment on the effect of an extra child on a mother’s work. Like all experiments, it is not perfect – it cannot identify the impact of a first child and of course relates to the specific circumstances of a twin birth. We do, however, provide a host of robustness checks, including two other natural experiments that likewise idiosyncratically change the propensity of having an additional child (Angrist and Evans 1998, Klemp and Weisdorf 2016), and find the same patterns. Our results are summarised in Figure 1, where we plot the effect of fertility on mothers’ labour supply (vertical axis) against GDP per capita (horizontal axis). At a lower level of income, there is no causal negative relationship between fertility and mother’s labour supply. This result shows up with remarkable consistency across time and space. That is, women in the US or Western Europe pre-WWII made similar labour supply decision in response to additional children as women in developing countries today. Moreover, the lack of a negative impact at low levels of development lines up with related studies (Aguero and Marks 2008, 2011) of childless mothers undergoing infertility treatments in a range of developing countries. Notes: This figure plots the second stage instrumental variables estimates of the effect of a third child on mothers’ labour force participation using twin births. See Aaronson et al. (2017) for data and methodology details, first stage results, and a series of robustness checks on model specification, data construction, and rescaling. By contrast, at higher levels of GDP, we find a negative effect of fertility on labour supply, consistent with the prior literature based on modern US data and Western European countries (Angrist and Evans 1998, Cristia 2008, Lundborg et al. 2016). This negative effect is again remarkably robust. Moreover, the impact is economically significant, implying that having an additional child reduces mother’s labour force participation by roughly 7 to 10.2 percentage points (on a base rate of 67.8%). By combining evidence for both developing and developed countries, including a panel of countries that transition from developing to developed over a long period, we are able to link two separate points in the development cycle to unearth an underlying process. As countries develop, women’s labour supply becomes more responsive to additional children. Consequently, the global decline in fertility over the last century has, if anything, played a positive role in increasing women’s work in developed countries but has had a negligible impact in developing countries. A natural mechanism to explain this pattern is the cost of childcare. From both the economic history literature and our contemporary knowledge of developing countries, we know that at low levels of GDP, women work primarily in environments that are often compatible with childcare (e.g. home and/or farm production). That is less the case in wealthier countries where available jobs shift to formal wage work. 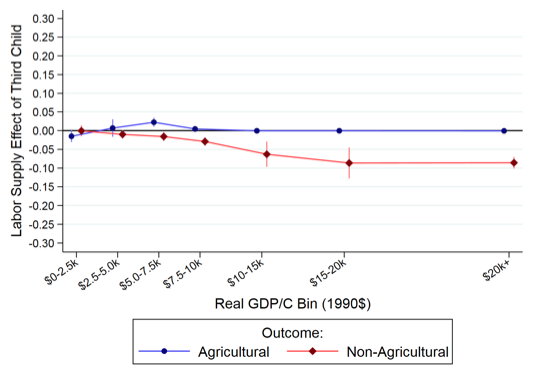 To evaluate this hypothesis, we take a second look at our data in Figure 2, where we examine the effect of children on working in agriculture versus non-agricultural occupations or in professional versus non-professional occupations. 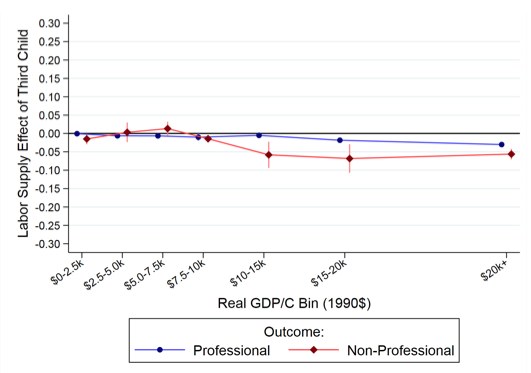 The results strikingly support the view that the negative gradient between children and work is very much a feature of non-agricultural, non-professional work. Nonetheless, this evidence is indirect, since we can’t attach a specific number to the difference in the cost of childcare between these different work arrangements. Notes: This figure plots the second stage IV estimates of the effect of a third child on mother's type of work using twin births. Note that rescaling the estimates to account for varying secular rates of labour force participation leads to noisier but similar patterns. See Aaronson et al. (2017) for these details. There is, however, a growing literature that uses quasi-experimental variation in access to childcare or early education to study mother’s labour supply in individual countries, including the US (Cascio 2009, Fitzpatrick 2012, Herbst 2017), Argentina (Berlinski and Galiani 2007), Canada (Baker et al. 2008), and Norway (Havnes and Mogstad 2011). To take one example, Herbst (2017) analyses the WWII-era US Lanham Act that provided childcare services to working mothers with young children. In a period when we find the aggregate labour supply response of mothers to additional children was close to zero, Herbst reports that additional Lantham Act childcare funding raised mother’s labour force participation. Summarising this literature, Morrisey (2017) concludes that the availability of childcare and early education generally increases the labour supply of mothers. We view this literature as supportive of the view that the negative effect of fertility on labour supply is amplified if childcare costs increase because jobs become less conducive to child rearing, and, if so, this dynamic could be stronger among lower wage mothers (e.g. non-professionals in Figure 2) with less flexibility to provide childcare to young children (Blau and Winkler 2017). In discussing the evolution of female labour force participation in the US, Goldin (1990) notes that “… women on farms and in cities were active participants [in labour] when the home and workplace were unified, and their participation likely declined as the marketplace widened and the specialisation of tasks was enlarged.” In examining the relationship between labour supply and fertility over the process of development, we arrive at a parallel conclusion. The declining female labour supply response to fertility is especially strong in wage work that is likely the least compatible with concurrent childcare. We see three implications of these results. First, in thinking about the U-shaped pattern of labour force participation that has been widely documented in the economic history literature, our results suggest that decreases in fertility play an explanatory role. That is, as fertility rates have declined over the latter half of the 20th century, the responsiveness of labour supply to fertility has increased, contributing to increases in female labour force participation, and heightened the relevance of childcare costs in mothers’ labour supply decisions. Second, among developing countries, our results suggest, however, that changes in fertility tend not to have a large impact on labour force participation, arguing against fertility-reduction policies specifically motivated by women’s labour force participation and its contribution to growth. Third, at least when it comes to fertility and labour supply, our results point to a remarkable consilience between historical and contemporary evidence. Authors’ note: The views expressed here are not necessarily those of the Federal Reserve Bank of Chicago or the Federal Reserve System. Aaronson, D, R Dehejia, A Jordan, C Pop-Eleches, C Samii and K Schulze (2017), “The effect of fertility on mothers’ labor supply over the last two centuries”, NBER Working Paper no 23717. Agüero, J and M Marks (2008), “Motherhood and female labor force participation: Evidence from infertility shocks”, American Economic Review 98(2): 500–504. Agüero, J and M Marks (2011), “Motherhood and female labor supply in the developing world evidence from infertility shocks”, Journal of Human Resources 46(4): 800–826. Angrist, J and W Evans (1998), “Children and their parents’ labor supply: Evidence from exogenous variation in family size”, American Economic Review 88(3): 450–477. Baker, M, J Gruber and K Milligan (2008), “Universal child-care, maternal labor supply, and family well-being”, Journal of Political Economy 116: 709–45. Berlinski, S and S Galiani (2007), “The effect of a large expansion of pre-primary school facilities on preschool attendance and maternal employment”, Labour Economics 14: 665–680. Bhalotra, S and D Clarke (2016), “The twin instrument”, IZA, Working paper. Black, S, P Devereux and K Salvanes (2005), “The more the merrier? The effect of family composition on children’s education”, Quarterly Journal of Economics 120(2): 669-700. Blau, F and A Winkler (2017), “Women, work, and family”, NBER Working Paper no 23644. Bronars, S and J Grogger (1994), “The economic consequences of unwed motherhood: Using twin births as a natural experiment", American Economic Review 84(5): 1141-1156. Cascio, E (2009), “Maternal labor supply and the introduction of kindergartens into American public schools”, Journal of Human Resources 44: 140–70. Cristia, J (2008), “The effect of a first child on female labor supply: Evidence from women seeking fertility services”, Journal of Human Resources 43(3): 487–510. Fitzpatrick, M (2012), “Revising our thinking about the relationship between maternal labor supply and preschool”, Journal of Human Resources 47: 583–612. Goldin, C (1995), “The U-shaped female labor force function in economic development and economic history”, in T P Schultz (ed), Investment in Women’s Human Capital and Economic Development, Chicago: University of Chicago Press, 61-90. Goldin, C (1990), Understanding the Gender Gap: An Economic History of American Women, New York: Oxford University Press. Havnes, T and M Mogstad (2011), “Money for nothing? Universal child care and maternal employment”, Journal of Public Economics 95: 1455–1465. Herbst, C (2017), “Universal child care, maternal employment, and children’s long-run outcomes: Evidence from the US Lanham Act of 1940”, Journal of Labor Economics 35(2): 519-564. Klemp, M and J Weisdorf (2016), “Fecundity, fertility and the formation of human capital”, University of Warwick, Working paper. Laughlin, L (2013), “Who’s minding the kids? Child care arrangements: Spring 2011”, US Census Bureau, Report P70-135. Morrissey, T (2017), “Child care and parent labor force participation: A review of the research literature”, Review of Economics of the Household 15: 1–24. Rosenzweig, M and K Wolpin (1980), “Testing the quantity-quality fertility model: The use of twins as a natural experiment”, Econometrica 48(1): 227–240.